Nathan Bradley Tabor married Mary A. Mollie Bagwell, daughter of Milas Nathaniel Bagwell and Margaret Farris Kelley, on 16 July 1868. John Jasper "Squire" Trussell was born on 3 April 1849. He married Margaret Bagwell, daughter of Henderson Onie Bagwell and Margaret Stone. John Jasper "Squire" Trussell died on 18 December 1928 at age 79. He was buried at Honea Path Presbyterian Church Cemetery, Honea Path, Anderson County, South Carolina. Monroe, La. Roll for Nov. and Dec., 1862, ?Absent. Sent to Hospl. Sick Since Nov. 4th.? Roll for March and April, 1863, ?Absent. Detached Left at Meridian, Miss.? Roll for May and June. 1863, ?Absent. At Vicksburg Since May 16th, 1863, with Leave.? ARTICLE FROM THE ADVANCE REPORTER, AUG. 19, 1926: "UNCLE BILL BAGWELL DIED WEDNESDAY" Uncle Bill Bagwell, a well known citizen, died at the home of his daughter, Mrs. Ernest Tate, in Waldron Wednesday. Mr. Bagwell was well advanced in age and was an ex confederate soldier. He had been in ill health for some time and his passing, though regretted by his many friends, was not unexpected. He was buried at the Duncan Cemetery Thursday. He was buried at Cedar Grove Cemetery, Boothe, Scott County, Arkansas. [S515] United States Federal Census, Washington, District of Columbia, Population Schedule: Tomlinson, Scott, Arkansas; Enumeration District: 168; Page: 7, Dwelling: 63, Family Number: 64, Date: 1880. [S517] United States Federal Census, Washington, District of Columbia, Population Schedule: Union, Louisiana; Page 65; Dwelling Number: 414; Family Number: 414, Date: 1860. Elizabeth Jane Solley was born circa 1848 in Alabama.1,2 As of 21 December 1866,her married name was Bagwell. She married William Jefferson Bagwell, son of Wiley Biggers Bagwell and Susan J. Bagwell, on 21 December 1866.2 Elizabeth Jane Solley died in January 1892 in Scott County, Arkansas. It is presumeded that she dies while or shortly after giving birth. She was buried at Cedar Grove Cemetery, Boothe, Scott County, Arkansas. [S507] World War I Draft Registration Cards, WW I Draft Registration: Seaborn Franklin Bagwell, Roll: 1530474; Draft Board: 0. [S508] Arkansas Registration Location: Logan, WW II Draft Registration Card: Seaborn Franklin Bagwell, Roll: WW2_2139764. Wells Gidion married Lucinda (Cindy) Andeline Bagwell, daughter of William Jefferson Bagwell and Elizabeth Jane Solley. Her married name was Hamby. Ida J. Bagwell married Rufus Hamby. Ida J. Bagwell was born in 1874 in Arkansas.1 She was the daughter of William Jefferson Bagwell and Elizabeth Jane Solley. Rufus Hamby married Ida J. Bagwell, daughter of William Jefferson Bagwell and Elizabeth Jane Solley. Dollie Ann Bagwell was born on 29 March 1877 in Scott County, Arkansas.1 She was the daughter of William Jefferson Bagwell and Elizabeth Jane Solley. As of 6 September 1891,her married name was Lewis. Dollie Ann Bagwell married Bud Lewis on 6 September 1891 at Scott County, Arkansas. As of after 1910,her married name was Webb. Dollie Ann Bagwell married (?) Webb after 1910. Dollie Ann Bagwell died in 1963 in Muskogee, Muskogee County, Oklahoma. She was buried at Tahlequah Cemetery, Tahlequah, Cherokee County, Oklahoma. Bud Lewis married Dollie Ann Bagwell, daughter of William Jefferson Bagwell and Elizabeth Jane Solley, on 6 September 1891 at Scott County, Arkansas. Carl D. Lewis was born after 1892 in Wilburton, Oklahoma. He was the son of Bud Lewis and Dollie Ann Bagwell. Maude Lewis was born after 1892. She was the daughter of Bud Lewis and Dollie Ann Bagwell. As of after 1905,her married name was Burchett. Maude Lewis married (?) Burchett after 1905. (?) Burchett married Maude Lewis, daughter of Bud Lewis and Dollie Ann Bagwell, after 1905. Her married name was Williams. Lorene Lewis married (?) Williams. Lorene Lewis was born after 1905. She was the daughter of Bud Lewis and Dollie Ann Bagwell. (?) Williams married Lorene Lewis, daughter of Bud Lewis and Dollie Ann Bagwell. (?) Webb married Dollie Ann Bagwell, daughter of William Jefferson Bagwell and Elizabeth Jane Solley, after 1910. [S513] United States Federal Census, Washington, District of Columbia, Population Schedule: Tomlinson, Logan, Arkansas, Emuneration District: 182, Supervisor District: 4, Sheet: 3B, Dwelling: 45, Family Number: 46, Date: 1910. [S514] United States Federal Census, Washington, District of Columbia, Population Schedule: Praire, Sebastian, Akansas, Emuneration District: 66-27, Supervisor District: 5, Sheet: 1B, Dwelling: 20, Family Number: 20, Date: 1930. John Riley Bagwell was born on 25 November 1892. He was the son of William Jefferson Bagwell and Susan Emeline King Jenkins. He was only in his 20's when he died. Story goes that a stallion reared up on him and trampled him. John Riley Bagwell married Delta Mae Mitchell before 1914. John Riley Bagwell died on 3 November 1918 in Scott County, Arkansas, at age 25. Susan Emeline King Jenkins was born in June 1853 in Georgia. As of 15 March 1892,her married name was Bagwell. She married William Jefferson Bagwell, son of Wiley Biggers Bagwell and Susan J. Bagwell, on 15 March 1892. William Jefferson married Mrs. Susan Emeline King Jenkins on March 15, 1892, which would have been just 2 months after John was born. It states he was 48 and she was 37 when they married. The story handed down is that Grandpa Bagwell needed someone to help him immediately with 10 children and 1 being a 2 month old, so he posted an ad in a paper. Mrs. Jenkins, assumed to be a widow, answered the ad and he wired her the money to ride by train to Waldron, Scott, Co. AR. He and the kids picked her up in a wagon and headed down to the courthouse to be married. Susan was supposedly a very wealthy heiress of the King Ranch in Texas, which is where she moved from to marry William, but I've never been able to substantiate any of it. I do know she didn't have any money; so she may have been dis-inherited for some reason???? She had a daughter from presumably, Mr. Jenkins, named Willie Jenkins, b. 1888. Willie later married a Mr. Cain. William Jefferson Bagwell filed for divorce from Susan Emeline King Jenkins on 2 August 1897; and the case was dismissed. She died on 6 February 1907 in Jack County, Texas, at age 53. Georgia Mae Bagwell was born on 22 August 1894 in Scott County, Arkansas. She was the daughter of William Jefferson Bagwell and Susan Emeline King Jenkins. Georgia Mae Bagwell married Earnest Lee Tate circa 1910. Her married name was Tate. Georgia Mae Bagwell died on 17 January 1974 in Jones, Oklahoma, at age 79. She was buried at Duncan Cemetery, Waldron, Scott County, Georgia. Earnest Lee Tate was born on 9 May 1888 in Arkansas. He married Georgia Mae Bagwell, daughter of William Jefferson Bagwell and Susan Emeline King Jenkins, circa 1910. Earnest Lee Tate died in 1998. Mattie Florence Bagwell was born on 26 August 1896 in Waldron, Scott County, Arkansas. She was the daughter of William Jefferson Bagwell and Susan Emeline King Jenkins. As of 1925,her married name was Childers. Mattie Florence Bagwell married Alford Maloy Childers in 1925. Mattie Florence Bagwell died in 1964 in Oklahoma City, Oklahoma. She was buried at Damon Cemetery, Wilburton, Oklahoma. Alford Maloy Childers was born on 23 January 1884 in Clarksville, Red River County, Texas. He married Mattie Florence Bagwell, daughter of William Jefferson Bagwell and Susan Emeline King Jenkins, in 1925. Alford Maloy Childers died on 8 December 1947 in Wilburton, Latimer County, Texas, at age 63. 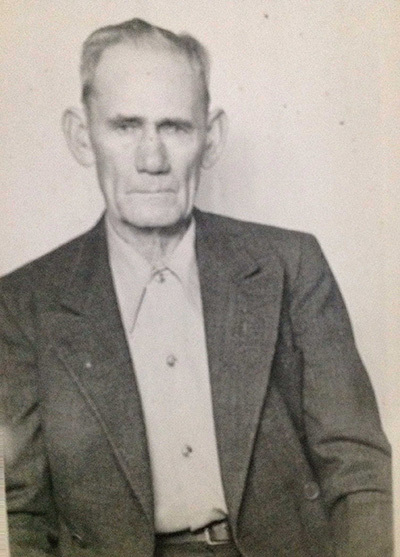 Johnny Lee Tate is the son of Earnest Lee Tate and Georgia Mae Bagwell. Johnny Lee Tate married Foye Juanita Rhyne.